Utah Diné Bikéyah is happy to take requests for interviews by media outlets committed to respectful cultural coverage. Please allow sufficient time for us to respond. Many of our representatives live rurally and remotely with limited access to communication technologies, and may not be available for interviews immediately. UDB will respond to press inquiries as quickly as possible. Curious? Excited? Further questions about Bears Ears? UDB would love to hear from you! Use our contact form below or email us at: info@utahdinebikeyah.org. We’ll respond as soon as we can. Thank you! Please note that we are often in rural, remote areas with limited phone access. Please leave us a message so we can get back to you. 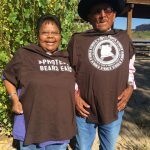 If you would like to learn more about the Bears Ears Proposal or are interested in helping out in other ways, check these links.